We’d love your help. Let us know what’s wrong with this preview of Memory and Magic by Erica David. To ask other readers questions about Memory and Magic, please sign up. Is there a lot of pictures in the book? My daughter can't read yet and loves looking at all the pictures. Not sure if there would be many in it for her to look at. This is a chapter book featuring Anna and Elsa and is set after events in the film, “Frozen.” It is the second book in what, I hope, will turn out to be a series. The first book was, “All Hail the Queen.” In this book, Anna is worried at Elsa always telling her to be careful. Why are her childhood memories all so foggy? She can’t seem to remember anything at all about Elsa’s magic? Anna is determined to get to the bottom of the mystery and sets out to try to discover the truth about what happene This is a chapter book featuring Anna and Elsa and is set after events in the film, “Frozen.” It is the second book in what, I hope, will turn out to be a series. The first book was, “All Hail the Queen.” In this book, Anna is worried at Elsa always telling her to be careful. Why are her childhood memories all so foggy? She can’t seem to remember anything at all about Elsa’s magic? Anna is determined to get to the bottom of the mystery and sets out to try to discover the truth about what happened when she was a child. With 121 pages and ten chapters, this is a wonderful chapter book for Frozen fans. It is ideal for confident readers to read on their own, or to read aloud to a younger child. There are black and white illustrations and it is nice to have new stories, rather than just the film story being re-told. If you child enjoyed the part of the film where Elsa and Anna were little, they should enjoy this, as it features Anna and Elsa as children as well as grown princesses. Read this with my daughter. She's 4 and loves princesses, superheroes, magic, and adventure. This was filled with 3 out of 4. Despite it being a chapter book and slightly above my daughter's level, it kept her attention. We read a chapter at a time. the chapters weren't overly long which was great for her attention span, but long enough to help her relax before bed. A cute and fun story from Frozen's "expanded universe". I do not like fantasy books because i like science or true stories. Frozen- you love the movie if you are about 6 and under. If you are 7 and older you hate it. I am older than 7. Not a great book in my opinion. This is such a good follow-up series to the Frozen movie. In the first book, Elsa learns how to balance using her powers and utilizing other methods to help the villagers with their problems. In this one, Anna deals with having had her memories of her sister's magic removed when she was a child. I think one of the things that really draws me to this series is that when you watch a movie, you usually still have so many questions you want answered after it ends. This series is a great way to find answers to some of those questions. Well-written, I found this one especially funny. I really liked Brock and Kristoff's hilarious interactions. Magic is everywhere you look. This was a really cute children's story building up after the events of the Frozen movie. Anna is in search of the memories that the elder troll hide from her as a child, but as the story unfolds she learns some important life lessons ab out her relationship with her sister and the both of them are stronger for it. It's a fast paced story that builds well and I think would be handled well by those who read it, it's not toned down intellectually, and calls things by w Magic is everywhere you look. It's a fast paced story that builds well and I think would be handled well by those who read it, it's not toned down intellectually, and calls things by what they are instead of choosing smaller words. There is a little bit of humor to the relationship between Anna and Kristoph, but nothing that was in depth or that the kids would even notice. The second instalment in this series of books. This book is more cohesive than the first one with a solid story that develops through the chapters. The topic of Anna's memories is interesting and I like the fact that the way that is treated here doesn't interfere with the canon from the movies. So, I hope they include this topic in the sequel as well. I love the way the characters are in canon and the overall story and message are positive with a lot of sisterly love and friendship. Without a doub The second instalment in this series of books. This book is more cohesive than the first one with a solid story that develops through the chapters. The topic of Anna's memories is interesting and I like the fact that the way that is treated here doesn't interfere with the canon from the movies. So, I hope they include this topic in the sequel as well. I read this to my five year old over three or four bedtime reading sessions. I was surprised by how well the book blended both a story easy for small children to enjoy with grown up emotional concepts like loss and regret. Secretly hoping she will pick out more from this series. This was the first chapter book I read by myself. At the end it had the fire, but Elsa put it out with her powers. I love the Frozen movie. I'm a kid at heart. I'm also a mom of 4 young boys so I jumped at this cute book I found at the library. In Memory and Magic, Anna begins to worry about her memory. She's just now realizing that she has very few memories of playing with her sister in their childhood, and, absolutely no memories of her sister having magic. She learns that Elsa and Kristoff both knew that the trolls took her memories or changed her memories. She wants those memories back! It doesn't seem fair that Elsa can remember things that she can't. Elsa supports Anna in her quest to get those memories back. Even if it means tru In Memory and Magic, Anna begins to worry about her memory. She's just now realizing that she has very few memories of playing with her sister in their childhood, and, absolutely no memories of her sister having magic. She learns that Elsa and Kristoff both knew that the trolls took her memories or changed her memories. She wants those memories back! It doesn't seem fair that Elsa can remember things that she can't. Elsa supports Anna in her quest to get those memories back. Even if it means trusting a less than reliable troll--a rogue troll, if you will. I liked this one fine. I didn't not like it, mind you. But I didn't necessarily find it wonderful either. I will mention that this one shares several memories from their childhood. In this sequel to Frozen, Anna suffers from some sort of PTSD about having her memories wiped as a child. Unfortunately, since Elsa is ashamed and also suffering due to her almost killing her sister, the only answer available to Anna is to seek some wanna-be magic doctor who makes her dance around like a chicken to gain her memories. Does it work? I dunno you will have to read it to find out! On a real note - I am finding it difficult to take these books seriously. I don't get the Frozen vibe fro In this sequel to Frozen, Anna suffers from some sort of PTSD about having her memories wiped as a child. Unfortunately, since Elsa is ashamed and also suffering due to her almost killing her sister, the only answer available to Anna is to seek some wanna-be magic doctor who makes her dance around like a chicken to gain her memories. Does it work? I dunno you will have to read it to find out! I'd wondered about Anna's memories when the movie ended. This book finally addresses the question of what Anna actually remembers and how she feels about the fact that her entire life was really a lie. You heard me, it was a LIE! Seriously, it's a topic worth exploring, which Anna does, trying every crazy thing she can to remember. The process almost burns down the entire forest, but working together leads to a satisfying conclusion...somewhat. I actually kind of feel for the girl. Head trauma is I'd wondered about Anna's memories when the movie ended. This book finally addresses the question of what Anna actually remembers and how she feels about the fact that her entire life was really a lie. You heard me, it was a LIE! Seriously, it's a topic worth exploring, which Anna does, trying every crazy thing she can to remember. The process almost burns down the entire forest, but working together leads to a satisfying conclusion...somewhat. I actually kind of feel for the girl. Head trauma is a nasty business and if she doesn't come away with a good does of PTSD I would be very surprised. In Book 2, Anna realizes that she never really asked about her lost/removed memories. So, she goes to Brock the Troll to get them back. That doesn't work, and instead, he ends up starting a fire that takes everyone, including all the trolls, to put out. In the end, Anna has to fill in all the magical details of Anna's memories that she says aloud. I did not like this book as well as I did like A Warm Welcome (#3). Still really enjoying this series. In this book, Anna is having trouble with her memory, trying to remember things from her childhood. This book has everything good that the first book had. The characters are still true to their film counterparts. New minor characters are introduced and Anna and Elsa are still developing their sister relationship after having so much time apart. Very happy with this book. Tras muchos años separadas, Anna y Elsa por fi n tienen la oportunidad de pasar tiempo juntas y disfrutar la una de la otra. A Anna le gustaría poder recordar los maravillosos momentos que vivieron cuando eran pequeñas, pero hay algo que no le cuadra. Un pequeño trol se ha ofrecido a devolver a Anna los recuerdos de la magia de Elsa que el Gran Pabbie le borró. ¿Será una buena idea? My daughters and I enjoyed this second Anna & Elsa book. It was nice to see some of the exploration of Anna's missing childhood memories--great connection to the movie. The chapters are a great length for evening reading--long enough that one will suffice if we are short on time, but short enough that I don't mind reading a few at once. Amazing story! The pictures were great and the story was easy to follow without being boring. There was a grammatical error but other than that the story was fantastic. 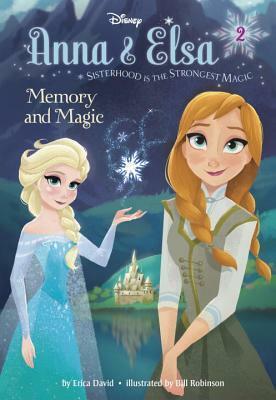 Fans of Frozen will love it, and sisters can learn a lot about getting along and working together from this book. I would recommend it to any young child looking for an easy and fun chapter book to read. Another super cute story about Anna and Elsa. This book tackles the difficult subject laid out in the movie, Anna's memories. Anna must decide whether she wants the strange troll Brock to help her regain her memories of Elsa's magic or not. Super super cute! Highly recommend this to all Frozen fans, young and old. I like the premise of this story better than the first book. It's understandable that Anna wants to regain her lost memories with her sister when they were children. Isn't the troll community a tight-knitted one? I wonder about the young troll, though, whom Kristoff and the other trolls don't know much about. It is weird! But, I do like the ending and how the problem was resolved. Cute continuation of the Anna and Elsa story. Anna realizes that she has no memories of Elsa's magic from when they are children. When she finds out that her memories of magic were erased she decides that she will find a way to restore them, even if it means trusting the magic of a strange troll. Good for ages 5 and up. I love reading these books with my daughter! This book goes into how Anna doesn't remember Elsa's magic growing up, which was something I felt was left unsaid and unfinished in the film. Fun times, if you have a young kid who loves Frozen, read these to them/with them. After all the years apart that Elsa and Anna had, they want to remember the times they had as kids together. But, Anna can't remember because the troll removed her memories because Elsa didn't want everyone to know about her magic, but now she's queen so everyone does.